Campus Pre-proposal: 04/11/19 via this form. 1. Facilitate P–16 STEM Education Outreach. Cultivate sustained, coordinated preschool through undergraduate partnerships to engage students in STEM experiences early and consistently, involving university faculty and students to meet STEM education challenges. 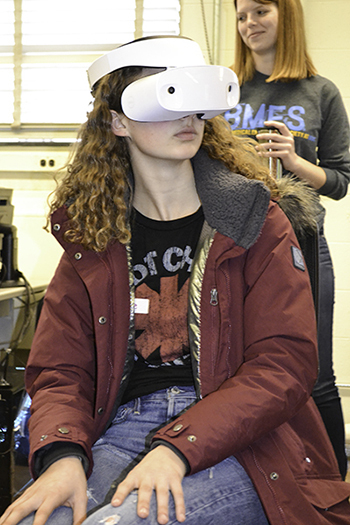 A high school student experiences the human brain via virutal reality during BMES's session at Introduce-a-Girl-to-Engineering Day 2018. 2. Improve STEM Teacher Training and Professional Development Quality. Revitalize STEM teacher preservice education, induction, and professional development programs that attract and prepare a diverse group of P–16 STEM teachers and promote their effectiveness, retention, lifelong learning, and continued involvement in research. 3. Foster Undergraduate and Graduate STEM Education Reform. Champion accessible, engaging undergraduate and graduate STEM programs and research experiences to promote interest and success in STEM fields, including teaching, for diverse students. 4. Shape Policy and Advocate for STEM Education. Stimulate partnerships with Illinois business and industry, government agencies, educational institutions, and professional associations to understand the STEM pipeline, mainline and workforce development needs, opportunities, and challenges and to serve as advocates within the state.